Little, Brown Books for Young Readers, 9780316051583, 320pp. 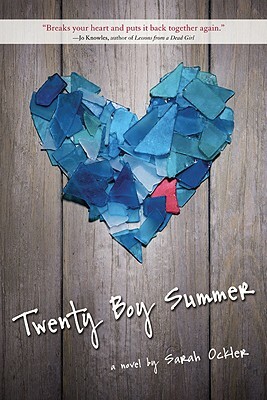 According to her best friend Frankie, twenty days in Zanzibar Bay is the perfect opportunity to have a summer fling, and if they meet one boy every day, there's a pretty good chance Anna will find her first summer romance. Anna lightheartedly agrees to the game, but there's something she hasn't told Frankie---she's already had that kind of romance, and it was with Frankie's older brother, Matt, just before his tragic death one year ago. Sarah Ockler wrote and illustrated her first book at age six--an adaptation of Steven Spielberg's E.T. Still recovering from her own adolescence, Sarah now writes for young adults. While nomadic at heart, she currently lives in Upstate New York with her husband Alex and an ever-expanding collection of sea glass.